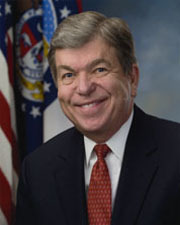 BLUNT, Roy, a Senator and a Representative from Missouri; born in Niangua, Webster County, Mo., January 10, 1950; graduated Southwest Baptist University, Bolivar, Mo., B.A., 1970; graduated Missouri State University, Springfield, Mo., M.A., 1972; high school history teacher; clerk and chief election officer, Greene County, Mo. 1973-1984; Missouri state secretary of state 1984-1993; president, Southwest Baptist University, Bolivar, Mo. 1993-1996; elected as a Republican to the One Hundred Fifth and to the six succeeding Congresses (January 3, 1997-January 3, 2011); majority whip (One Hundred Eighth through One Hundred Ninth Congresses); acting majority leader (One Hundred Ninth Congress, September 28, 2005-February 2, 2006); minority whip (One Hundred Tenth Congress); was not a candidate for reelection to the House of Representatives but was elected as a Republican to the United States Senate in 2010; reelected in 2016 for the term ending January 3, 2023; vice-chair, Republican Conference (2012-2018); chair, Republican Policy Committee (2019-); chair, Committee on Rules and Administration (One Hundred Fourteenth Congress, One Hundred Fifteenth Congress [January 3, 2017-January 20, 2017; April 10, 2018-January 3, 2019], and One Hundred Sixteenth Congress).